45 And immediately he required his disciples to enter into the boat and to go on ahead to the other side, to Bethsaida, while he dismisses the crowd. 46 And having left them, he went to the mountain to pray. 47 And evening having come, the boat was in the middle of the sea, and he was alone on the land. 48 And having seen them straining at rowing, for the wind was against them, as the night was ending, he comes to them walking on the sea and intending to pass by them. 49 And having seen him walking on the sea, they thought that it is a ghost and screamed. 50 For all saw him and were terrified. And immediately he spoke with them and says to them, “Have courage. I am [here]. Do not fear.” 51 And he went up into the boat to them, and the wind stopped. And they were extremely, utterly amazed. 52 For they did not understand about the loaves, but their heart was hardened. The word “straightway” indicates rushing, perhaps to escape the crowd’s attempt to recruit Jesus to lead a revolt. “Constrained” is a strong word; it is possible that Jesus strongly encouraged the disciples to enter the boat when they would have preferred not to. Perhaps they did not want to be separated from Jesus—especially after what happened during the last sea crossing (4:35–41)—and so they resisted his efforts. and to go to the other side before unto Bethsaida, while he sent away the people: They will not end up in Bethsaida (see 6:53 and the Notes there; compare 8:22 and its Notes). Some ancient manuscripts omit the phrase “to go to the other side”; this phrase was probably present originally but omitted since it did not match the outcome of the story. 6:46 And when he had sent them away: The word “them” is ambiguous; it could refer to the crowd, the disciples, or both. he departed into a mountain to pray: Because there is a definite article before “mountain” (“the mountain,” not “a mountain”), the mountain is more likely to have symbolic meaning. Because Moses goes up into a mountain to be with God (Ex. 24:15), mountains are symbolically understood as the place where God is revealed to humans (Deut. 33:2; Hab. 3:3). 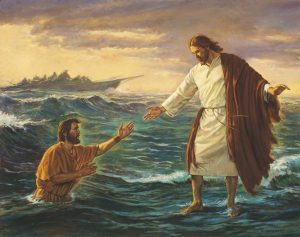 It is possible that this reference is meant to prime Mark’s audience for the idea that Jesus will be revealed to the disciples in the story of the walking on water. 6:47 And when even was come, the ship was in the midst of the sea, and he alone on the land. 48 And he saw them toiling in rowing; for the wind was contrary unto them: Jesus may still be on the mountain in these verses; he may be able to see their struggle either because of his vantage point or as a result of divine perception. The latter option may be more likely since it is nighttime. The word “toiling” can connote torment, so the disciples are pictured as struggling mightily. and about the fourth watch of the night he cometh unto them, walking upon the sea: Jews divided the night into three watches (shifts for watchmen) while the Romans had four watches, so Mark is using the Roman system here. The fourth watch was approximately three to six in the morning. The New Rendition uses the phrase “as the night was ending” to convey that it was almost morning and that the disciples had been struggling for the entire night. There must have been a small amount of early morning light already: the disciples think that they see a ghost, but in the ancient world, ghosts did not glow and therefore could be seen only if there were another light source. Allusion: God Controls the Seas. Only God controlled the seas, and therefore only God could have walked on water in the biblical view of the world. In Job 9:8, the LXX reads that God “walks upon the sea as upon dry ground.” An allusion to that text would thus align Jesus with God (see also Job 38:16; Ps. 77:19–20). and would have passed by them: This line has puzzled interpreters of Mark. Some have understood it to reflect the perspective of the disciples: they thought that Jesus was going to pass them by (and while Jesus’ own intentions are not stated in the text, one can presume that he was not going to pass them by). However, this reading does not cohere well with the disciples’ fear: Would they have screamed in terror at a ghost that appeared to be passing them by, or would they have been silently watchful? So a more likely reading is that “pass by them” indicates Jesus’ intention to parade by as a divine being. Several biblical texts make reference to a divine “parade,” in which God “passes by” a person as a way of revealing the divine presence. In the LXX, “to pass by” is “almost a technical term for a divine epiphany.” For example, Job 9:11 reads, “he goeth by me, and I see him not: he passeth on also, but I perceive him not.” Not only is the divine presence “passing by” Job, but Job is unaware of it, which is also the case for the disciples in Mark’s story. This text from Job may have particular resonance for Mark’s story since just a few verses before ( Job 9:8), Job described God as walking upon the sea: “thus, in Job 9 the image of God’s walking on the sea is linked with a confession of God’s mysterious transcendence of human comprehension: God’s ‘passing by’ is a metaphor for our inability to grasp his power.” This theme fits well into Mark’s message about the disciples’ lack of understanding. Other instances of God “passing by” humans include Exodus 33:19–34:8 and 1 Kings 19:11. In both of these texts, there is a water barrier that must be overcome; the fact that Moses and Elijah part the waters but Jesus walks on them indicates Jesus’ similarity to, but also his superiority to, these prophets. If these texts are the background to Mark’s story, it shifts the emphasis from Jesus walking on water to the manifestation of the divine. It appears that Jesus’ intention was to reveal himself as a divine being by “passing them by” as he walked on the water. 6:49 But when they saw him walking upon the sea: Note the contrast: the disciples use all of their physical strength but make little progress, while Jesus—without boat or oars—walks past them. they supposed it had been a spirit, and cried out: The KJV’s “spirit” is problematic because this is not the same word used for holy and unclean spirits in Mark. Rather, this word is best translated as “ghost.” The crying out of the disciples is screaming in terror. Mark is telling a ghost story that fits the conventions of Roman ghost stories, including a night setting and a fearful response. However, the one defining characteristic of ancient ghost stories is that ghosts could not walk on water: “Mark suggests that the disciples thought that Jesus was a ghost when they witnessed him doing one thing that ghosts absolutely cannot do: walk on water. The Jewish and Greco-Roman audience . . . would have been particularly dumbfounded by the disciples’ misunderstanding.” The idea that someone walking on water was a ghost was a comically illogical mistake. 6:50 For they all saw him, and were troubled. And immediately he talked with them, and saith unto them, Be of good cheer: it is I; be not afraid: “Be of good cheer” means that they should have courage (not that they should be cheerful). Relationship to Exodus 20:18–20. In this story, the people are aware of God’s presence on the mountain, and they are afraid. They want to keep their distance, and they want Moses (and only Moses) to speak with God. Moses tells them to have courage and that God has come to them to test them. The parallels to Mark’s story are instructive: Jesus too was in the mountain as the story begins, and the disciples are also afraid of him. In both cases the message to have courage is conveyed. An allusion to the Exodus text implies that the purpose of God’s presence was to test the people. So Jesus’ divine “passing by” and walking on the water is a test that, as Mark explains in 6:52, the disciples did not pass. But their continued presence with Jesus signals their ongoing willingness to learn and Jesus’ continued willingness to teach them. 6:51 And he went up unto them into the ship; and the wind ceased: Unlike the other sea crossing story, Jesus does not command calm. Here, it just happens when he enters the boat; it is possible that his mere presence stills the wind. Some ancient manuscripts omit “beyond measure.” In either case, the meaning is clear, and the only issue is the degree of amazement: with “beyond measure” included in the text, there are three references to their state (“amazed,” “sore,” and “beyond measure”), but without it, there are two references (“amazed” and “sore”). Some ancient manuscripts omit “and wondered.” The phrase appears to have been added later by scribes who were perhaps thinking of Acts 2:7, where the same two verbs are used. It makes better sense in context to omit “and wondered” because the next verse indicates that their problem was that they were not wondering (or considering) what they had seen. 6:52 For they considered not the miracle of the loaves: This line is an aside from the author to the audience. It implies that the point of the feeding miracle was not just the provision of food, but rather the story contained some deeper message that the disciples should have considered. While Mark does not mention it, it is possible that the baskets of leftovers are in the boat with the disciples. If so, their failure to think about what is literally in front of their faces is all the more ironic. But what precisely should they have considered? Jesus’ passing by, walking on water, and “I am” statement were supposed to be interpreted by the disciples as evidence that he is the God of the HB. But the disciples were not able to understand this message because they did not consider how the feeding miracle also showed Jesus to be like God, who provided manna to the people in the wilderness. Mark refers to “the loaves,” not “the loaves and fishes” or “the feeding miracle” or to any other miracle or event in Jesus’ ministry. Mark thus focuses attention on the loaves. Perhaps the point is that the disciples were the ones who distributed the loaves to the crowd, and so they should have learned about the exercise of Jesus’ power and authority from their own participation in it. If the ancient belief that demons controlled the seas is behind this story, then the point would be that the disciples should have used the power that Jesus had delegated to them to control demons (a power that they had just used to distribute miraculously produced bread) in order to cross the sea. And as in the feeding miracle, where they wanted to buy bread with money, here they use human resources (rowing) instead of relying on spiritual power to solve their problems. If the multiplication of the loaves was a reiteration of the miracle of the manna, then it should be no surprise that Jesus could walk on water, a miracle that is very similar to the parting of the Red Sea. Had the disciples understood the first miracle (that the multiplication of the loaves meant that Jesus was the new Moses), then they should have had no trouble understanding the second (that Jesus was able to cross the hostile waters, as Moses did). Relationship to Joshua 1. In Joshua 1:10–18, the children of Israel stop receiving manna and have to prepare rations. They eat manna and fish on the banks of the Jordan River. A few items link to the previous story of the feeding miracle: they are to pass over in groups of fifty, the twelve men make a memorial, and Numbers 27:17 uses sheep/shepherd imagery to describe Joshua taking over for Moses. Jesus’ compassion could be understood as his desire for them to have a leader who could lead them to the promised land. This reading explains the military imagery: they are the force that will invade the promised land under the direction of Joshua/Jesus. Perhaps the baskets of leftovers were taken up in analogy to some manna being kept “as a testimony.” (That idea fits nicely with the idea that Jesus will later ask them what they took up [8:19–21]; they were supposed to remember it as a memorial). Moses told his people to leave, just as Jesus dismisses the Twelve, and then both Jesus and Moses go up the mountain to be with God. This intertext might explain why considering the loaves would have made it possible for the disciples to have understood this miracle better: the feeding miracle—with its groups of fifty, divine provision of food, and memorial related to the number twelve (the twelve baskets of leftovers)—began the reiteration of the story of Joshua 1, which continued as Jesus asked the disciples to cross over in the boat without him, as a reenactment of entering the promised land. Because chapter 7 shows Jesus in gentile territory, there is even the hint that the “new promised land” is not traditionally Jewish territory. The importance of the allusion to Joshua 1 is that it links the feeding miracle with the sea crossing and then explains why the disciples should have considered them together. Because the disciples’ hearts were hardened, they did not consider the miracle of the loaves. Because they did not consider the miracle of the loaves, their hearts were hardened. Relationship to the Exodus. A key theme in the story of the Exodus is the progressive hardening of Pharaoh’s heart as he rejects the implications of the plagues. Here, the disciples are acting as Pharaoh did by refusing to consider the meaning of the miracles that they have witnessed. Of course, Jesus’ miracles are not plagues but rather displays of power that bless those impacted by them. Much as the point of the plagues was so that Pharaoh would know the Lord, the disciples should have learned more about the identity of Jesus. Jesus is a new Moses, leading a new exodus, bringing his people out from slavery and into freedom. The motif of freedom bridges nicely into the next chapter, with its focus on Jesus’ interpretation of the purity laws. This story is not primarily about Jesus walking on water but rather about Jesus’ attempt to reveal his true nature to his disciples and their (comical) failure to understand him. Jesus presents himself in this story in a manner by which it should have been clear to his disciples that he is doing what only God can do (by walking on water and by passing them by), but they don’t understand; rather, they assume that he is the one thing that he cannot possibly be. They not only do not recognize Jesus as God, but they also do not recognize him as Jesus. Mark’s irony is as overwhelming as it is sad. Mark does not say what exactly it was about the loaves that the disciples should have considered, so the text is wonderfully elliptical; Mark has left some of the task of consideration to the audience so they can learn for themselves. Richard B. Hays, “Can the Gospels Teach Us How to Read the Old Testament?” Pro Ecclesia 11, no. 4 (2002): 410. Jason Robert Combs, “A Ghost on the Water? Understanding an Absurdity in Mark 6:49–50,” Journal of Biblical Literature 127, no. 2 (2008): 358. Comfort, New Testament Text and Translation Commentary, 116–17. J. Duncan M. Derrett, “Why and How Jesus Walked on the Sea,” Novum Testamentum 23, no. 4 (1981): 330–48.